I took the Richie family consisting of Clair, Andrew, Sam and Jacob to Malta to complete their Open Water dives on the 26th to 30th October. 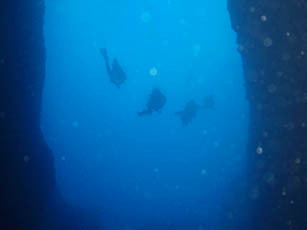 We carried out the first two dives at Ghar Lapsie, a perfect site for the first 2 dives. The water was warm and the viz good. We returned to the accomodation all smiles ready for the next days diving. The second day took us to Crickawwa where we dived the reef to the left, dropping down to see the statue of the Virgin Mary, and then the second dive to the left, again the viz was good and Andrew, Clair and Sam completed their dives for there Open Water qualification and Jacob his Scuba Diver certification. 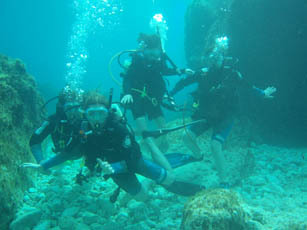 We decided to take a trip to Gozo for the last day and used it as a sightseeing trip as well as a diving trip. We first drove over to the Azule window, Blue Hole where we dived first, the swell was extremely strong and forced us off course on the return leg of the dive and instead of coming back through the Blue Hole we came over the coral garden. Never underestimate the power of the sea even if you have dived in a location many times!!!! The second dive we dived the inland sea, it was particularly clear. A super dive. On our return drive we took time to visit the citadel in Victoria, the old city before catching the ferry back. The following day we drove round to Valleta, Midina, and once packed then headed to the airport for our flight back to the UK at 6pm.